Gallaher provides a comprehensive array of services to ensure your business is adequately protected. In addition to 24/7 emergency services, inspection and testing, and maintenance, we offer the latest in security and fire alarm monitoring with our Intelli-G wireless monitoring solution. Intelli-G does not require phone lines or traditional connectivity, instead operating on a reliable private wireless network. Virtually every building, process, service, design, and installation is affected by NFPA's 300+ codes and standards. Our inspectors are knowledgeable and understand the importance of NFPA compliance to ensure the safety and protection of people and assets. Honeywell eVance™ Services Solution is software that allows Gallaher to streamline our inspection processes. It is a comprehensive, connected field solution suite that automates and centralizes building inspection and service management operations using mobile technology. As a partner with Honeywell, we understand that inspection and testing goes far beyond the alarm systems of the past. Current technology incorporates network, wireless, and interconnected monitoring systems to ensure facilities are appropriately monitored and secured. ONYXWorks is a single-point-of-control workstation for centralized life safety management that allows personnel to rapidly identify and respond to alarm events with minimal operator training. 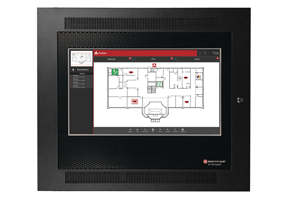 ONYX FirstVisionTM displays critical information on the origin and spread of a fire for single or multi-building sites, allowing firefighters to quickly address the situation. Gallaher installs, inspects, and tests these and many more life safety systems.